A very welcome addition to the craft distilling movement sweeping the country, Pickering’s Gin is a testament to the passion and enthusiasm of its founders, self confessed gin nuts Marcus Pickering and Matthew Gammell. Pickering’s is produced in a small but perfectly formed new distillery in what were once the dog kennels of the Small Animal Hospital at the former School of Veterinary Studies, now the Summerhall arts hub in Edinburgh. As the first gin distillery in Scotland’s capital for over a hundred and fifty years Pickering’s embodies very Scottish traditions of craftsmanship, quality and innovation. Pickering’s contains nine botanicals: juniper, coriander, cardamom, angelica, fennel, anise, lemon, lime and cloves. The recipe is an old family recipe handed down from the final days of the Raj in India, a time when gin ruled supreme in the world of drinks. This botanical mix is combined with a neutral grain spirit and water in a specially commissioned 500 litre copper pot still known as Gert. Then the magic begins as distillation transforms the raw materials of spirit and botanicals into gin. But rather than the conventional methods of firing up the still Pickering’s brings something new to gin technology in that heat is applied by means of a “bain marie” system designed and built by Matthew Gammell. Here slow, immersive heat gently embeds the botanical flavours in the spirit capturing the fresh citrus notes as well as the more earthy spice aromas. The result is a gin that has the clean fresh pine notes of juniper at its heart and is strongly aromatic in the mouth with hints of liquorice and warm spice. The crisp dry finish is characterised by a lingering lavender-like softness. Reduced with local water to 42% ABV, what we end up with is a true gin lover’s gin. As you would expect from a classic gin, Pickering’s is excellent in a G and T with a recommended garnish of a wedge of pink grapefruit or a stalk of fresh lemongrass. Its robust character also stands up well to mixers like ginger ale and in the delightful combination of Earl Grey tea, elderflower cordial and sparkling wine known as Lady Pickering. Every drop of Pickering’s Gin is distilled, bottled and labelled at the Summerhall Distillery, which is open to the public to pop in and visit, or you can book tours via their website or phone. It’s also available on tap at Summerhall’s bar next door. But gin this good doesn’t stay a secret for long and its fame has not only spread throughout Scotland but crossed the border to high end outlets throughout the UK like Harrods and Fortnum & Mason. Pickering’s Gin is made at The Summerhall Distillery Limited, 1 Summerhall, Edinburgh, EH9 1PL, Scotland. 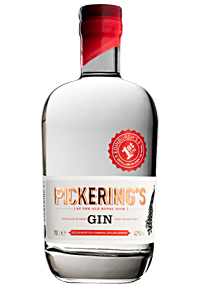 You can also buy Pickering’s Gin at pickeringsgin.com (UK addresses only). Pickering’s Gin is available in top bars, restaurants and independent wine shops throughout the UK. The full list of stockists is also available on their website..